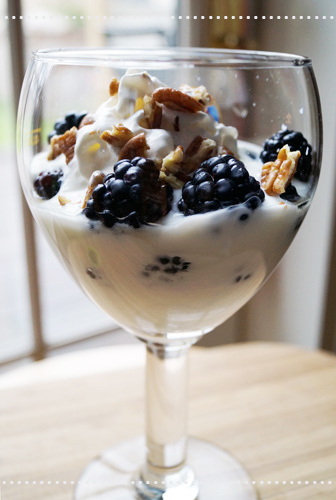 This light low-carb parfait is ideal for snack time and is quick to make. Parfaits are creamy and smooth and make a great recipe for a beautiful, wholesome, and healthy start of your day. You can serve with low-carb granola bars or biscuits. It is a beautifully layered family-pleasing dessert that tastes great and blends delicious flavors. Yogurt also combines well with passion fruit, mango, kiwi, and other fruits. Just use your favorite fruit or your kids' favorite to make it. If you wish to make something impressive and delicious for company, this is the perfect choice. Combine vanilla, yogurt, lemon peel, and sugar substitute in a bowl. Blend well. Rinse the blackberries. You can also use a combination of frozen blackberries and fresh blackberries. Use parfait glasses to assemble. Layer 2 - 3 tablespoons of the yogurt mix at the bottom of 4 glasses. Add blackberries and walnuts, then a layer of the yogurt mix and blackberries on top. Garnish with whipped cream and shredded dark chocolate. Serve immediately or, chill for 2 - 3 hours, and serve.